Help your burger live up to its fullest potential in these All A.1. Burgers. Mix the beef with A.1. Original Sauce before grilling our All A.1. Burgers. Mix meat and 2 Tbsp. A.1. ; shape into 4 (1/2-inch-thick) patties. Grill 5 to 6 min. on each side or until done (160ºF), adding buns, cut sides down, to grill for the last 2 min. 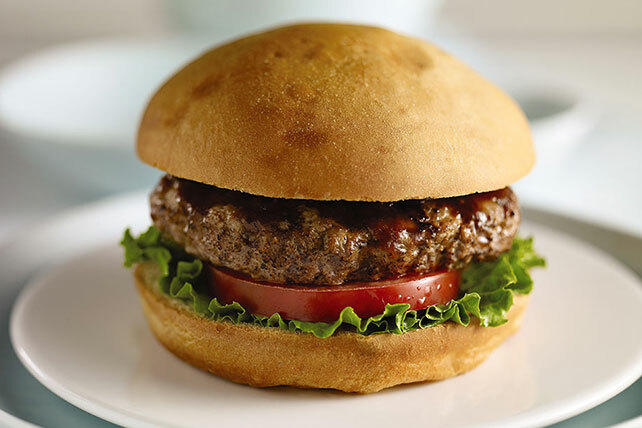 Place lettuce on bottom halves of buns; top with tomatoes, burgers and remaining A.1. Sauce. Cover with tops of buns. Use two fingers to make slight indentation in top of each meat patty. This allows the meat to expand and keep its round shape through the cooking process.